The Ahnapee State Trail was once part of the Ahnapee & Western Railroad. Photo courtesy of the Kewaunee County Promotion and Recreation Department. We are quick to praise Door County’s five state parks as the crown jewels of the county, but we often forget about the Ahnapee State Trail. The county-operated trail runs 48 miles between Sturgeon Bay and Algoma and its history as a railroad predates the founding of the parks system. In the early 1890s, the Ahnapee and Western Railroad Company laid down track between Casco in Kewaunee County to Sturgeon Bay, stopping in Algoma along the way. The rail hooked up with the Casco Junction, providing a line to Green Bay as well. In August 1968, the railroad company embargoed Sturgeon Bay, saying the track between Algoma and Sturgeon Bay was unsafe. Shortly after that, the company sold the track to the state. In 1970, the Natural Resources Board approved the Ahnapee State Trail as one of Wisconsin’s state parks. The stretch between Casco and Algoma was still an operational railroad until the late 1980s, when a washout at the Kewaunee River took out one of the railroad’s bridges. The abandonment of that railroad doubled the length of the trail and further expansions are still in the pipeline. Today, the trail offers mostly flat, hard-packed gravel through evergreen glades, farmland, prairies and wooded areas. The Ice Age National Scenic Trail, a 1,200-mile meander through Wisconsin, takes advantage of 27 miles of the Ahnapee State Trail, including the eastern trailhead in Potawatomi State Park. In 2016, Door County received $209,000 in a grant to extend the trail north to the Michigan Street roundabout near the Sturgeon Bay YMCA. The county is now considering another five mile expansion of the trail along County Hwy. 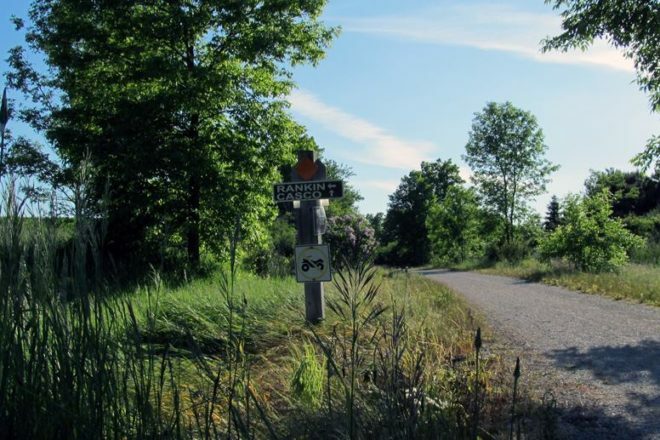 A between County V in Jacksonport north to County E. While that trail will not connect to the trailhead in Sturgeon Bay, the goal is to eventually connect the entire system. Although it’s a state trail, Door and Kewaunee counties maintain and expand the trail with the occasional grant from the state. Once a major shipping railroad line, the trail now serves a quieter commute for recreational bicyclists, pedestrians, equestrians and snowmobilers.